Exchange server capability on the G1 is non-existent from a native perspective, however thanks to third-party software developer Wrike, ContactsSync takes care of it - and best of all, it is free. 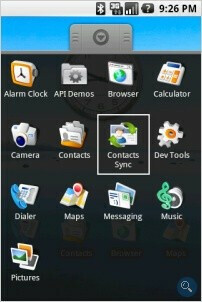 The application doesn't provide full exchange functionality, however; for example, contacts only sync to the phone. When adding a contact to the phone, it doesn't sync to the server, although the functionality is coming, according to Wrike. In regards to e-mail, company spokeswoman Valerie Sinitskaya said that "Users can access their email from Exchange using IMAP, so we don't have plans to sync email." What remains to be seen, however, is whether business users will be swayed by the relative lack of exchange support (at least at the initial launch). This software is very limited. It only works with Exchange 2007 and will only sync your contacts. The have mentioned plans to do more than contacts in the future, but after contacting them to see if they are planning on making it compatible with earlier version of Exchange their response was "We do not have plans to support Exchange 2003 at this time."